And the stars have never shone brighter. The Fault In Our Stars is one of the most magical films you will ever see. It is also one of the most tragic, heartbreaking, funny, genuine, and real films you will ever see. It does exactly what the book does, and exactly what movies are supposed to do: it sweeps you away, transporting you, making you forget about your own reality and immerses you into the reality of these fictional characters that don’t seem so fictional. While I was watching the movie, someone in the audience leaned over to me and asked if this was a true story. “No, but it deserves to be,” I thought to myself. Based off of the highly popular book of the same name by John Green, The Fault In Our Stars follows the story of Hazel Grace Lancaster (Shailene Woodley), a spirited, spunky, and sarcastic teenager who loves to read books, watch horrible reality TV shows, and question everything her parents tell her to do. Augustus Waters (Ansel Elgort) is another spirited, spunky, and sarcastic teenager who loves to watch movies, play video games, and ponder the many questions about the universe. 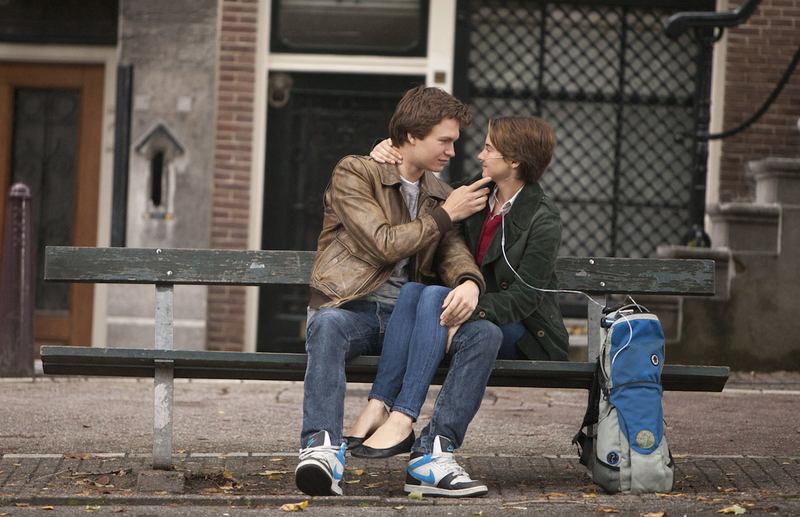 Hazel and Gus are both like any regular teenager but with one significant difference: they’re cancer survivors. Note that I said survivors. They’ve had cancer in the past, Hazel in her lungs and Gus in his right leg, but both have since moved on from their ordeals to try and tackle their lives as any other teenager would. Because of Hazel’s lungs, she has to carry around a respiratory machine (Oxygen tank instead? Machine sounds intensive) with her everywhere she goes, and what would seem like a simple task to anyone else (I.e. standing up, or walking a flight of stairs), nearly exhausts Hazel after doing so. Gus, on the other hand, has a prosthetic replacing his right leg in exchange for being cancer free. One day, they both meet each other at a cancer support group meeting. Hazel notices Gus having a bounce to his step, despite only having one full leg. Gus notices Hazel’s beautiful face even though she’s deoxygenated. As they continue to meet and see each other, they soon realize that they have a special relationship with each other, one that no “normal” human being could ever possess. From a first glance, some people may look at this movie and see it as an overly optimistic tween romance, where two characters fall in love, and their love beats all things, including their ailments. I know I did when I first heard about it, and why wouldn’t I? Romantic dramedies have a way of underemphasizing conflicts just so characters can have happy endings. As a result, we get movies that are more cheesy and insincere than they are genuine and heartfelt, much like those ungodly Nicholas Sparks movies. I know, I’m late on writing this review. Why am I writing this in October, when the movie has already come out on DVD? I was waiting, dear reader. Waiting to read the book and see not only how faithful the movie was to it’s source material, but also to it’s emotions. I’ve said it before, and I’ll say it again: you can bend the plot of the original story, but you cannot bend the emotions and still remain faithful. Now I have read the book, and I can tell you firsthand from my experience that the movie held up to the book on both counts. The Fault In Our Stars is a breathtaking experience: touching, deliberate, and beautiful all at once. To say it’s faithful to the book is an understatement. It’s quite possibly one of the best book-to-movie adaptations I’ve ever seen. The things that work so well in the movie are the same things that work so well in the book: the writing and the characters. At the heart of the entire story, movie and book included, is Hazel Grace, who is such a fascinating and singular character that it makes me sad to think that she doesn’t exist. Hazel isn’t like other cancer-ridden characters. She neither has an overly defeatist attitude of her ailment, or an overly optimistic perspective one either. She’s in the neutral realm, seeing her sickness as a part of her no matter what she does, and choosing to accept it because she’s more or less forced to. And yet, she’s so much more than her sickness. In many ways, she’s just like any other regular teenager. She has a favorite book. A favorite author. A favorite show. A favorite food. A crush. And like any other teenager her age, she’s bursting with opinions, hopes, fears, and desires, all of which combine to make a completely fascinating, involving and passionate character. We quickly learn to love Hazel not because she has cancer, but because she is unique. On that note, let me talk about Augustus. Can I just say that I love this kid? Gus is filled with spirit and enthusiasm, having a bounce to his step that contrasts with Hazel’s shy trotting. I find it interesting that even though I don’t like it when characters are unrealistically happy, here Gus is almost nothing but happy. He thinks it’s cool that he has a metal prosthetic leg, seeing it as him being half-cyborg. He likes video games, zombies, and heroism, seeing himself as one of the brave movie heroes who sacrifices himself for the sake of the people he loves. In many ways, that’s who he is: the hero of the movie, bringing all of the love and affection he could for the woman he loves. He’s so great in the film, he could have a movie all to himself if he wanted to. You’ll notice that I’ve referred to both of these persons by their characters, not by the actors that portray them. That’s because Woodley and Elgort slip so wonderfully into their roles that they’ve completely disappeared into them. I didn’t think about The Descendants when I saw Woodley tear up and cry, or when she picked up her BiPAP and exhausted herself walking up the stairs. I didn’t think of Divergent when Elgort so tenderly cared to her needs, or sweetly telling her that he would be honored to have his heart broken by her. I saw these actors and was so immersed into their performances that I no longer thought about what they were and thought more about who they were. These two are not Shailene Woodley and Ansel Elgort. They are Hazel Grace Lancaster and Augustus Waters. Everything else in this movie was made to near perfection. The screenplay by Scott Neustadter and Michael Weber adapted the story and emotions wonderfully from the book. The camera work by Ben Richardson was elegant and harmonic, much like the great work he did with 2012’s Beasts of the Southern Wild. And director Josh Boone guides the actors through the blissfully tragic story created by John Green, whose wondrous words were what made this entire movie possible. That ends the review with one question: which is better? The book, or the movie? Neither. I could argue that the book is better because it has more content, or I could argue the movie is better because it brought the story to life visually. Both arguments are pointless. They are both two different mediums, but they both tell the same wonderful story.